When you have two noun phrases in apposition, the usual treatment in English intonation is to accent both. If, as often, they are placed in separate intonation phrases, there is usually tone concord between the two (English Intonation, p. 85). ˈLet me introˈduce you to my \colleague, | \Charles. Oh, and ˈthis is \Mary, | a\nother colleague. I’ve got ˈMr /Bun, | the /baker, | and ˈMrs \Plod, | the po\liceman’s wife. In another kind of apposition (or something similar), one of the elements is more like a title. In this case the two parts are usually placed within a single IP. In yet a third type the second element is more or less redundant as far as information content is concerned. Unsurprisingly, in view of this, it is typically deaccented. I ˈcan’t ˈstand that \Thatcher woman. I was reminded of this type of apposition (or whatever) when reading the story “The Aunt and the Sluggard” in P.G. 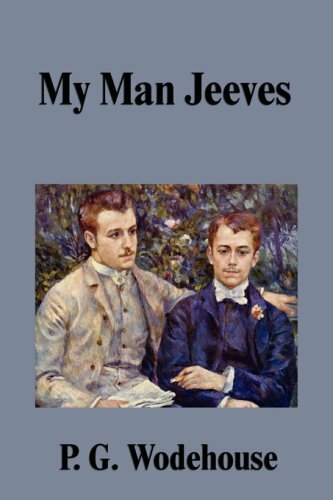 Wodehouse’s, My Man Jeeves, 1919 (free download on my Kindle). Jeeves is my man, you know. Officially he pulls in his weekly wages for pressing my clothes and all that sort of thing; but actually he’s more like what the poet Johnnie called some bird of his acquaintance who was apt to rally round him in times of need — a guide, don’t you know; philosopher, if I remember rightly, and — I rather fancy — friend. I rely on him at every turn. Here, the construction the poet Johnnie is not like the poet Milton or the poet Keats. Johnnie is not the poet’s name. It means no more than ‘fellow, chap’, implying that the hearer must be familiar with the poet although the speaker can’t for the moment recall his name. And Johnnie is not accented: the ˈpoet Johnnie. In this phrase I can see that NNSs might be misled both into accenting Johnnie and into imagining that Johnnie was the name of a poet. But then Wodehouse is full of traps for the NNS. He writes in a particularly idiomatic way — and in a colloquial idiom that is no longer to be heard in contemporary English. Anyway, what I really find irritating every (frequent) time I read it, even in edited texts, is a comma in front of the name, eg the novelist, Martin Amis. This only works if talk was of the novelist before and now we learn or are reminded of his identity, or if there was only one. I wonder how this comes about, because it suggests an intonation that is hardly implied. Probably simply a confusion with the opposite order of main noun and apposition (Martin Amis, the novelist), independent of intonation. I think I'd have been tripped up by the poet Johnnie as well, at least momentarily. I agree with Lipman, there is no good reason to capitalise johnnie there. Non-phonetic aside - even Orwell can present problems these days, what with the change of idiom since his era. I just read Burmese Days, where a man rather desperately tries to propose to a woman by saying "You should have a piano", and it took me a few moments to realise that he meant "You would have a piano [if we got married]", not "You ought to have a piano". Surely if you feel that the poet has a name which you might use if you knew it, then Johnnie is a substitute name, and must therefore be capitalised. That's how I feel, and that's how Wodehouse's editor felt. I suspect that Wodehouse himself felt the same. Not to capitalise is to equate poet Johnnie with poetry wallah. If that's how you feel, then that's how you should spell it. What do you think of "ˈnovelist ˈMartin \Amis", "'British 'bank \Barclays" with no article? I thought it was an Americanism, but then found myself doing it, with awkward consequences. I was introducing my mother to a dowager friend's son in their grand library, and said "This is son J". She is very deaf, and since it was such a grand family she heard that as "Sir J". She thought he must be a baronet, and thereafter called him Sir J. If this ill-articulated usage is not in fact American, I'm sure it must be distinctly non-U, but it's such hard work saying anything to a warmongering harridan with a disappearing hearing aid, which only disappears for the purpose of using her deafness as a lethal weapon. David, I was going along with the others about the counter-intuitive capitalization. You did give me pause, but even if it was Wodehouse's preference or his editor's I still think this use of 'johnnie' for any man or boy parallels the use of 'sheila' for a woman or girl, though the dictionaries are not so unanimous about non-capitalization as with 'sheila'. Not to capitalise is to equate poet Johnnie with poetry wallah. I'm quite sure this is exactly what's meant. I'm (passively) familiar with the expression in the plural, too ("those tailor johnnies do a good job"), and never thought it might be an ad-hoc placeholder for a name one can't think of right now, similar to the poet Whatsisname, where the placeholder is stressed the same way the original name would be. Here are some quotes for johnnies from Wodehouse, Jerome K. Jerome and James Joyce. It's really the same use as chap(pie)s, blokes &c. That Johnny is sometimes capitalised doesn't look that unexpected to me for the time, given that it's originally a proper name. LC 'herbert' has a similar pattern: oxforddictionaries.com lists it as LC: "an undistinguished or foolish man or youth:a bunch of spotty herberts" OED gives UC as well. And of course, guy is a man's name used as a colloquial term for man, and it's never capitalised. @ Mallamb: "This is son J" sounds strange to my American ears too. Out of the examples you gave, the only one that sounds like something I've heard here is "ˈnovelist ˈMartin \Amis". I feel like "'British 'bank \Barclays" has to have "the" in front of it. Maybe it's just me though. @ Mallamb your story sounds like you were really in a Wodehouse story!! Mallamb: You don't give enough context to be sure, but this looks like the American journalese habit of dropping sentence-initial articles: Focus of the discussion was the transition. As far as I can tell, this is meant to be bright and breezy. Yes it does look like it doesn't it? And not just American journalese. Now that you have located the address in my mental topography, I remember that interviews with celebs etc in Brit newspapers, even the old broadsheets, are often worded like this. "Son Jermayne and daughter Kayleigh have both followed their parents into the celebrity business." Thanks. I had been totally mystified by this turn of phrase on my part. Now it makes perfect sense to be made aware that I had to talk to my mother in headlines. But it's also salutary to be reminded that language has a life of its own and uses even such self-monitors as us in its own cavalier fashion. Phil, this is getting seriously off-piste except in respect of the Wodehouse connection to which Martin has archly attributed it, but by writing "This is son J" I may have made the usage seem stranger even than it still seems in retrospect. Rather than use the real initial of the man in the anecdote I used J because we were on the subject of Johnnies (not that he is one, by any reckoning). But using just an initial does seem to make it harder to imagine. Try thinking whether "This is son Jeremy" sounds any less strange. You may have been unconsciously echoing the name assigned some years ago to Jim Callaghan's son-in-law Peter Jay. As you've probably forgotten that you knew, this was a conscious echo of Indira Gandhi's son Sanjay — a hint of a comment on Jay's appointment as Ambassador to Washington. I was tripped up despite knowing what was likely to come. I desperately cast about for poets named John, that is, I read "Johnnie" as "John Whatshisname?". Back on phonetics - let's mention, just in case any NNS's didn't know, that Wodehouse is pronounced ˈwʊdhaʊs. Really? I always thought it was /wəʊhaʊs/, with no /d/. Not according to Wikipedia and the OED.